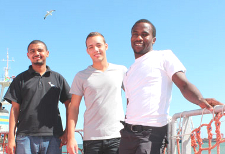 An internship opportunity with the Council for Scientific and Industrial Research has secured three engineering students passage on the SA Agulhas research vessel. The students, who hail from the Mechatronics and Electrical Engineering Departments, recently set sail on the SA Agulhas along with 30 other scientists, who will conduct research in the waters surrounding Antarctica. The trio have been interning at the CSIR since last year and jumped at the opportunity to spend several weeks aboard the research vessel. Electrical Engineering student JP Smith says they will provide researchers with technical support during the month-long research trip. JP says several laboratories have been set up on the ship and each will run different experiments. Mechatronics student Ashley Botes says they are well-prepared for the voyage, which will see them work with high-tech research equipment. “We are very excited about this opportunity,” says Ashley. Sinekhaya Dilana, who is studying Electrical Engineering, says he is looking forward to tackling the task ahead. The vessel will return to South African shores in March.